MEASAT Global Berhad has selected Astrium in June 2011 to build MEASAT-3b, a new satellite to augment its core Ku-band business in Malaysia, India and Indonesia. Planned to be launched in 2013 and positioned at 91.5°E, co-located with MEASAT-3 and MEASAT-3a, the powerful MEASAT-3b satellite will more than double the current Ku-band capacity operated by MEASAT. The agreement was executed by a MEASAT subsidiary. 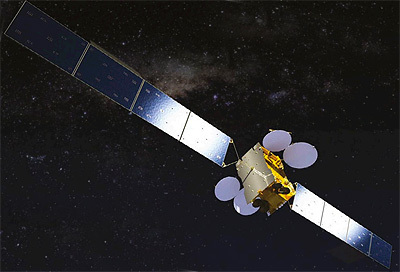 MEASAT-3b will be based on Astrium’s Eurostar-3000 platform and will be able to provide 48 Ku-band transponders simultaneously, providing MEASAT with large capacity and flexibility over three distinct geographical locations – Malaysia, Indonesia and India. The satellite has also been designed to support a fourth market. MEASAT-3b is designed to have a launch mass of 5.8 tons, an electrical power of 16 kW, and is planned for more than 15 years of operation. Australian operator NewSat Ltd. announced in February 2012, that an undisclosed number of Ku-band transponders will be marketed as Jabiru 2.